Here I am, still posting about what I made for my Christmas dinner. And this is not the last one either. I hope you don’t mind. We really enjoyed these Biscotti for dessert with ice cream and sherbet. 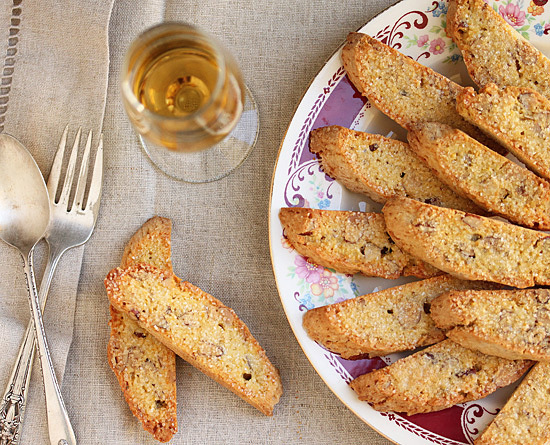 After a big meal – and we were stuffed – biscotti are a light, sweet end with serious flavor, but small portions. This biscotti recipe calls for ¼ cup of orange zest, so you can understand why they are orange colored. They also smell so amazingly of orange essence, that I have found myself walking through the kitchen and opening the biscotti container just to smell them. Aaah…. 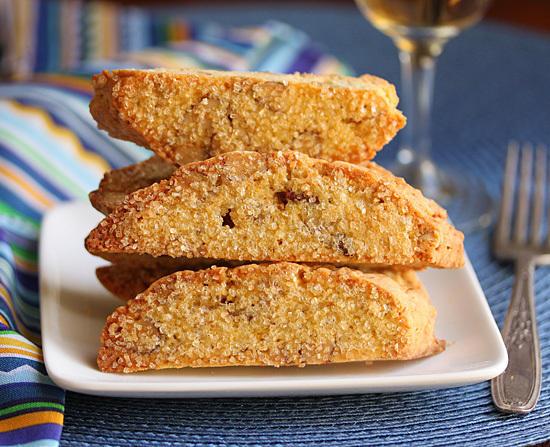 Biscotti is the plural form of biscotto, which originates from medieval Latin biscoctus meaning “twice-baked/cooked.” As they are very dry, they’re traditionally served with a drink into which they maybe dunked. In Italy, where they originated, they’re served with a Tuscan fortified wine called vin santo. Outside of Italy they more frequently accompany coffee, cappuccino, lattes or black tea. In Spain, they’re served with a small glass of a sweet dessert wine, such as muscat or moscatell. We had ours with coffee, but I didn’t see any dunking. They didn’t last long enough. It took 4 huge oranges to generate the ¼ cup of zest called for in the recipe. 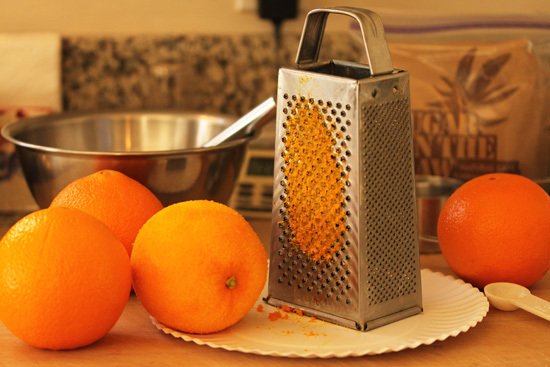 I prefer to use my box grater because it captures more of the juicy zest below the hard skin. The toasted almonds are roughly chopped in small handfuls. Each nut is cut into only 2 or 3 pieces. The dough for these biscotti is the stickiest stuff I have ever seen. Let it rest in the bowl for about 30 minutes for the gluten to rest. Using a large spatula, remove the dough from the bowl onto a floured surface. I know it looks like a big shaggy blob, but do not despair. You are going to transform this homely thing into beautiful butterflies. And this is what they will look like. Orange-hued and sparkling with turbinado sugar. A sight to behold. 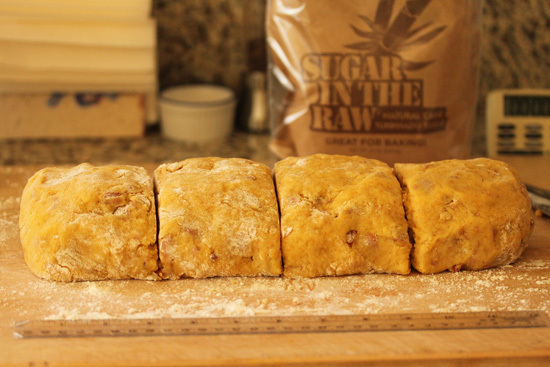 Take that big blob of dough and form/pat/roll it into a log about 12 inches long and divide it into 4 portions. 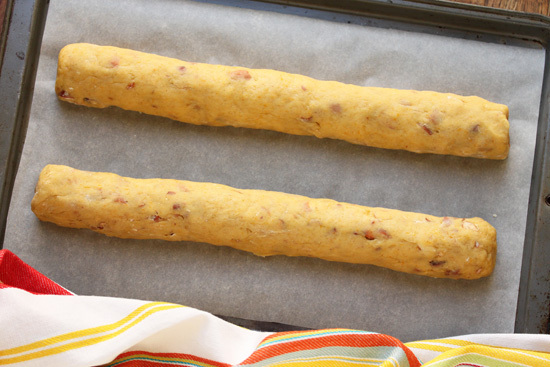 Take each portion and pat/roll it into a baton about 12 ½ inches long and place on parchment lined sheets. Cool baked batons completely on cooling racks on parchment. With a serrated knife, the batons are sliced on the diagonal. This photo shows the wonderful texture of the interior of the biscotti. Now they are brushed with beaten egg white and sprinkled with turbinado sugar, and baked again. Your kitchen is going to smell so good and you are going to eat too many right out of the oven. I had to put them in a container so I couldn’t see them. Just sayin’. 1. Preheat oven to 350 degrees F. Place top two oven racks in middle and top of oven. Line 2 cookie sheets with parchment paper. 2. On a separate baking sheet covered with foil, toast the almonds for about 15 minutes, until skins just start to crack. Remove foil with almonds to cool surface. 3. 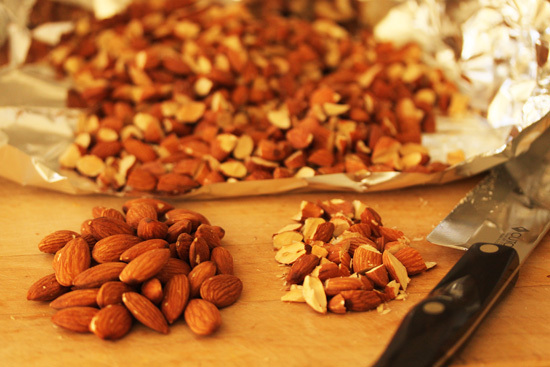 Roughly chop almonds, with each nut only being cut into two or three pieces. Chopping a handful at a time makes it easier to chop them evenly. Place chopped nuts back on foil. 4. Combine the flour, baking powder and salt in the bowl in an electric mixer fitted with paddle attachment. 5. In a separate bowl, whisk together the turbinado sugar, granulated sugar, orange zest and anise seeds until well combined. Add this mixture to the flour in the mixer bowl and mix to combine. 6. With mixer on slow speed add the chilled butter and mix until butter pieces are the size of large peas. You may want to cover the bowl with your hands or a kitchen towel as the flour flies out quite a bit. 7. In a separate small bowl, whisk together the eggs, orange juice and vanilla extract. Add to dough, mixing until just combined, being careful not to overmix. 8. Add the chopped almonds and mix for a few seconds to blend. The dough will be very sticky. Let it rest in the mixer bowl for about 30 minutes. 9. 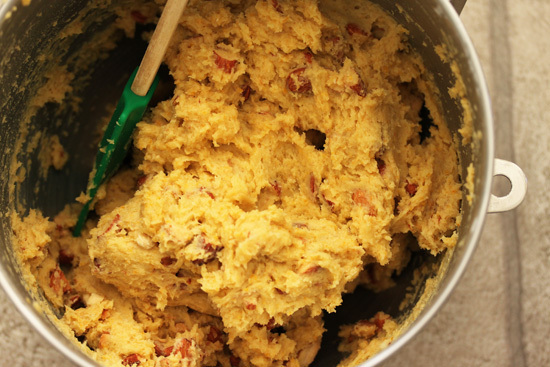 Remove the dough from the mixer bowl with a firm spatula onto a liberally floured surface. It will be a large, sticky, shaggy mass. 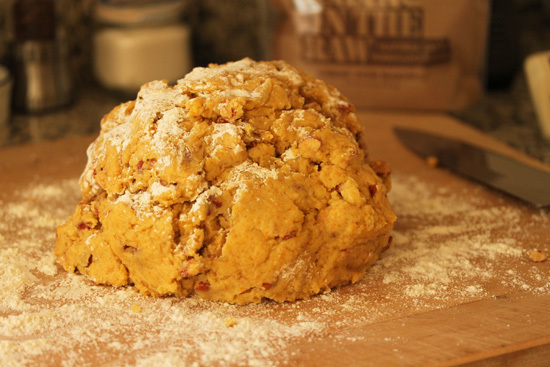 With floured hands, pat and roll the dough ball into a log about 12 inches long. Cut the log into 4 equal pieces. 10. Pat and roll each portion into a 12 ½-inch baton and place 2 on each parchment covered cookie sheet. Place both sheets in oven on top two racks and bake for 30 minutes, switching position of sheets half way through. 11. Remove from oven and slide each piece of parchment with batons from sheet onto cooling racks. Cool completely and remove from parchment. Reserve parchment and replace on two sheets. 12. With a serrated knife, cut one baton on an angle into ½-inch slices. Place slices on parchment covered sheets about ¾-inch apart, fitting as many as possible on two sheets. Note: If bottom of biscotti are too dark brown, shave that part off with your serrated knife before brushing with egg white. 13. 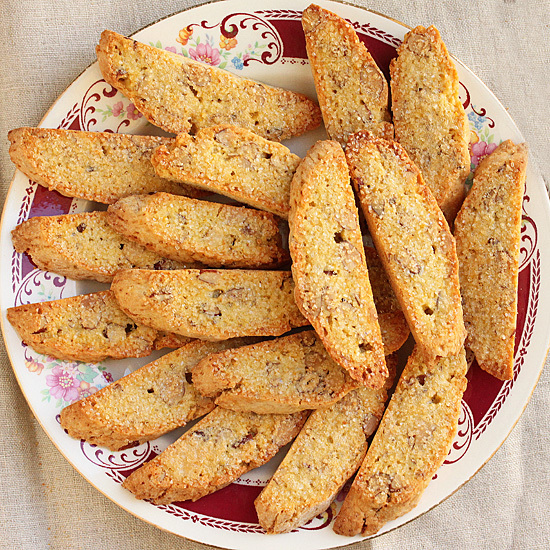 With a pastry brush, brush one biscotti with egg white and, using your fingers, sprinkle liberally with turbinado sugar. Do egg white and sugar on second biscotti, and continue in this manner until all biscotti are sugared. Note: Do not brush all biscotti with egg at once and then sprinkle sugar. The egg white sinks into the cookie and the sugar will not stick. 14. Bake 2 sheets for 13 minutes, then turn biscotti over. Switch position of sheets in oven and bake for an additional 5 minutes. Remove from parchment and cool on racks. Reuse parchment. 15. Continue with remaining batons as above. Note: Can be stored in air-tight container at room temperature for up to 2 weeks. 1/4th of a cup of zest – wow! I am extremely partial to orange zest and throw it into whatever I can. 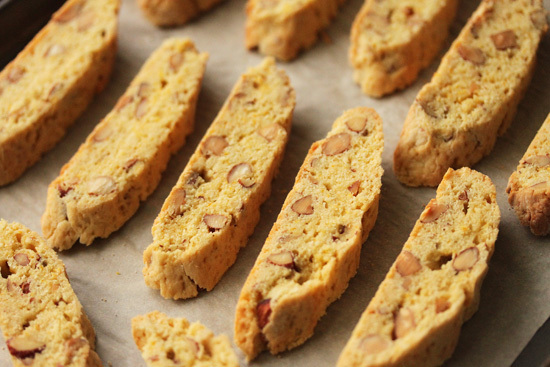 This biscotti is right up my alley – I can almost smell it all the way here. I know I’m making this right away. Those biscotti are really hamming it up for the camera. Look at them glisten! 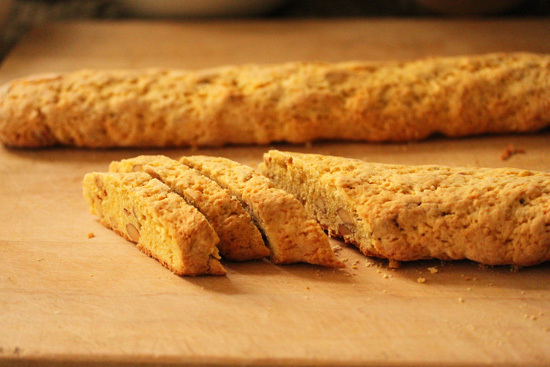 Biscotti are among my faves, so thanks for making it even harder to stick to my diet! Hi Lynne – I tried these today (after bookmarking for months!) and they are AWESOME! 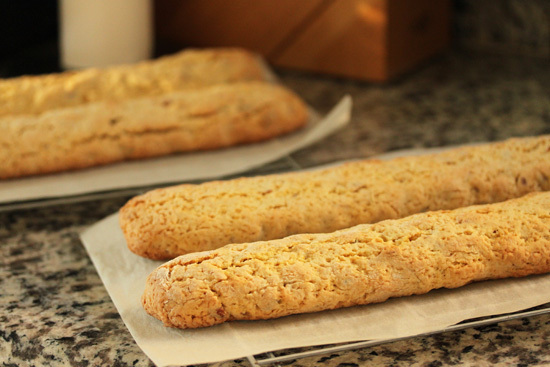 Thanks for posting this great biscotti recipe!